The Freemakers are sibling scavengers operating a salvage and repair shop on a space station at the distant edge of the Empire. When Force-sensitive 12-year old Rowan Freemaker discovers the Kyber Saber, an ancient artifact with a powerful connection to the Jedi, his world is turned upside down. Along with his quick-witted older sister Kordi, ace pilot brother Zander, and a refurbished battle droid named Roger, Rowan is thrown into an epic struggle against the Empire to restore peace to the galaxy. 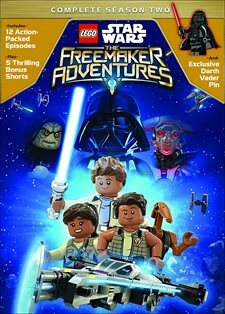 Download Lego Star Wars: The Freemaker Adventures in Digital HD from the iTunes store. Lego Star Wars: The Freemaker Adventures images are © Walt Disney Pictures. All Rights Reserved. Lego is a huge corporation that has expanded their universe over the past several years, incorporating new ways to get their products out to the public. This endeavor has included branching out into movies and television and showcasing well-known and beloved characters. In 2016, they decided to lend their name to probably the most well-known franchise in movie history – Star Wars. Their Emmy nominated animated series, Star Wars: The Freemaker Adventures, introduced new characters for fans to enjoy and follow on their journey throughout the galaxy. This past year, saw the show expand, as the second season offered twelve great episodes that are available now on DVD. As we meet up once again with the three Freemaker siblings, they have found a new home as they work with the Rebel fleet to fight against The Empire. Rowan (Nicolas Cantu; Sofia the First), Kordi (Vanessa Lengies; Glee), and Zander (Eugene Byrd; Sleepers) search the Universe looking for trash they can use to build new vehicles. However, like any good Star Wars plot, they must face the enemy including Imperial forces, Sith lords and a Hutt by the name of Graballa. And of course, they will face Darth Vader as they help the Rebels. The Series, which takes place between The Empire Strikes Back and Return of the Jedi, not only brought staple characters from the original films to the small screen but this season introduces the audience to lesser known and never before seen ones like the aforementioned Graballa the Hut and a new droid, M-OC. Season two also showcases Rowan as he becomes more aware and senses the force. This newfound energy helps him envision a shipped called the Arrowhead, which he and his siblings attempt to create and power with something called Kyber Crystals. The main cast is made up of three distinct individuals of varying ages who seem to mesh well vocally. They have great chemistry that makes their characters believable. Cantu does a great job for a young actor and Lengies and Byrd offer a more mature and seasoned overtone to their roles. Together, they are a good team bringing these siblings to life. There are litanies of supporting cast that seem to do a good job for the most part. Unlike Season One Season two was not given the Blu-ray treatment and is only offered on DVD and digital download. While the latter allows for some higher resolution video and audio quality, the former presents the standard fare. The graphics are well done for the most part. The DVD has an exclusive Darth Vader pin and five shorts which is nothing more than segments of Season Two, Episode One. The pin is cute and shrink-wrapped on a card that also has a code for 100 Disney Movie Rewards, which is a nice little bonus. 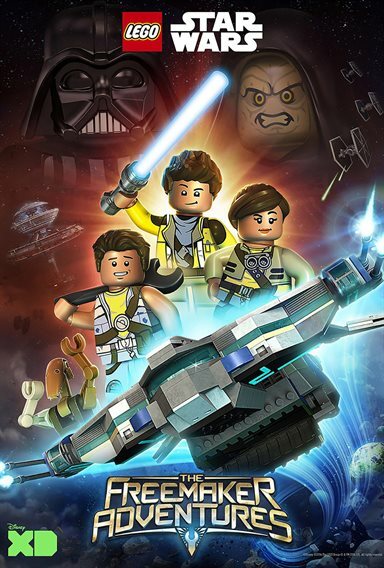 Lego has infused their movie and television properties with lots of fun and some great jokes and Lego Star Wars: The Freeman Adventures is no exception. The second Season offers more plot than the first one but the series overall is enjoyable and fun. Once again, Lego has created entertainment that the whole family can enjoy and, especially if you are a star wars fan, you should get to know this series and consider buying both Seasons One and Two.